From boating and sightseeing to swimming and fishing, you can find water fun all over New England. Many water activities are seasonal and are only available from May-September. Four miles of white sand and gentle surf, voted 'Best Beach' of Boston three years running. Bathhouses, lifeguards, and concession stand onsite and ample parking. Good Harbor Beach is a beautiful beach with lovely, white sand, and great waves facing the Atlantic. There is a concession stand, rest rooms, and showers. A family-owned recreational water facility complete with sandy beaches, alpine water slides, picnic areas and a snack bar. Fun for all ages. Key West moves to Massachusetts at CoCo Key Water Resort in Danvers! New England’s first indoor waterpark resort, it’s a great anytime getaway for the whole family. Tour Boston in an authentic, renovated World War II amphibious landing vehicle. The DUCK tours the city by both land and water. Great for kids and visitors. Great Wolf Lodge resort in Central MA, (about an hour from Boston), offers an indoor oasis of family fun including a wide variety of water park rides, as well as non-water activities like rock walls and mini-golf. Cool off on a hot summer day at the Rings Fountain in the Wharf District Parks. You can count 64 nozzles that shoot up in the air and create circles of vertical water. Salisbury Beach is a popular northern Massachusetts beach destination stretching 3.8 miles along the Atlantic Ocean. Swimming, boating, fishing and camping. Singing Beach, Manchester is one of the best beaches in MA and includes a beautiful sandy beach, restrooms and a nice concession stand. Limited Parking. The Boston Public Garden is oldest public park in the country, with relaxing swan-boat rides in the park's lake. The Swan Boat ride lasts about 12-15 minutes while the driver pedals you around the Public Garden lagoon. The Cape Cod Seashore offers six swimming beaches, eleven self-guiding nature trails, and a variety of picnic areas and scenic overlooks. Artesani Park & Wading Pool has lifeguards on duty, showers, changing rooms, picnic area, ice cream truck comes often, awesome playground for toddlers and older kids and plenty of parking. Truly is a gem. Ideal for toddlers through age 5 years. There are swings, slides and climbing structures, as well as a nifty Spray Pool that includes boulders for kids to climb over. From whale watching cruises, harbor sightseeing tours, and fast ferries to functions, private charters, and entertainment, you'll find it aboard Boston Harbor Cruises. Boston Outrigger is dedicated to expanding the sport of Hawaiian Outrigger Canoe racing along the East Coast. We are laways looking for people who want to join us in our 4 and 6 man ocean going canoes. Cool off at Canobie Lake Park's Castaway Island's water slides, water canons, zero depth entry pools and more. As for drying off, the Xtreme Frisbee can handle the job. Codzilla is Boston's first and only high-speed thrill boat ride featuring two turbo-charged diesel engines generating 2,800 horsepower and speeds of approximately 40 miles an hour. Community sailing & lessons for beginner and advanced sailors in a variety of boats, kids sail all summer for net to nothing. May-Oct. Charles River. Great open playground, better for preschool age, but toddlers can climb too with supervision. Features a great spray fountain for those hot summer days. Constitution Beach has swimming areas with lifeguards, a bathhouse with concessions, a relatively new, large playground, and tennis courts. Learn the ropes of white water rafting. At Crab Apple Whitewater, chose from six different whitewater rafting adventures. River rafting trips range from mild to WILD, full or half-day. Beat the heat this summer at a number of great pools & spray decks. Children must be accompanied by an adult. Swimming pools have a water depth of at least two feet. Showers are required before entering the pools. Kids love to keep cool at the Frog Pond at the Boston Common. Splash around in the a giant wading pool a stay cool in the fun fountains. 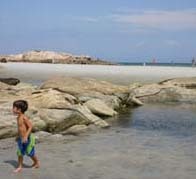 Gloucester boats several great family-friendly beaches that make the perfect day trip from Boston and environs. Swim, sun, walk, wade, or just relax. Bring a book and enjoy a day at the beach. Goldfish Swim School offers swim lessons for children ages 4 months and up, as well as family swim times, a rec team and birthday parties. Your Great Wolf Lodge New England adventure will begin in our massive, 84-degree indoor water park with over 68,000 square feet of water-packed excitement. A gorgeous 3 mile stretch of sandy beach. Features a bathhouse, snack bar, picnic tables, hiking, swimming and a campground next to the beach. Jamaica Pond is a good place to learn rowing and sailing. You can also fish there, and it is a fun place to go all year round. No swimming though. Kimball Farm is loaded with family fun including great Ice Cream, Mini Golf, Driving Range, Grill, Country Store, Farm Animals, & of course, a fun Bumper Boat Lagoon. Lake Boon in Stow has a quiet, family friendly beach (Stow Town Beach) with a playground and bathrooms. The beach is located at the north end of the lake, off of Sudbury Road. Liquid Planet Water Park is a locally-owned and family-run, inspired by New Hampshire's great outdoors. Enjoy slides, a lake with a beach, mini golf, a zip-line, and more. Hands-on lobstering cruise, pirate adventures and/or scenic tour of Plymouth Harbor. NARA Park is a relatively new park which was opened just six years ago off Rt. 27 in Acton, MA. NARA Park is open to the public year round. This is a beautiful place to your family. The 5,000-square-foot splash pad at Nelson Park is a refreshing place to cool off in the heat, and features motion and push-button activated jets of water shooting in different directions off a cool rubberized surface. For summer fun enjoy the huge outdoor pool equipped with giant slides. Water level ranges from 1.5 feet to 6 feet, so kids of all ages can have a blast here. The 3-mile crescent will be packed with Boston-area sunbathers and breeze-seekers on sweltering summer days, even in the middle of the week. Sail on the schooner Fame of Salem, an authentic replica of the successful privateer from the War of 1812. FAME sails every day -- 2 hour trips. The South Bridge Boat House provides canoe, kayak, motor boat rentals for use on the Concord River. Life vests and seat cushions are provided at no extra cost. Each summer The First Church of Christ, Scientist opens its beloved fountain to the public. On hot summer days you're sure to cool off at this famous landmark. Fall foliage canoeing and picnic on the Deerfield River. Enjoy the breathtaking views of the Berkshires in the full fall colors from a canoe. Canoeing or Kayaking for the Whole Family. We'll paddle the scenic Nashua River at a leisurely pace and break midway for a snack (provided). The Atkinson Pool is a year round aquatic facility. Check out tiny tot and family swim times for only $4 per family. Contact the pool for schedules. Surf the largest indoor surfing facility in North America at SkyVenture New Hampshire. Fun for the whole family, Water Wizz has something for everyone, including a giant wave pool, toddler areas, super slides, and a relaxing river float. 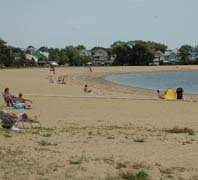 Wayland Town Beach is one of the many facilities operated by the Park and Recreation Department in Wayland. Wayside Racquet & Swim Club has long been known to the surrounding communities as the area's premier club for outdoor summer enjoyment. Zoar Outdoors offers a huge variety of guided 'human-powered' outdoor adventures in Western Mass. and beyond. Learn a new skill or find a new thrill! Equipment rentals are also available seasonally.